Russia is full of snow. Whether with this condition, did you know that Russia is still have the Active Volcanoes? Well, we could says this because you have to know this fact. We present to you more about Most Active Volcanes of Russia You Should Know. In 10 volcanoes active, there are 9 volcanoes that located on Kamchatka Peninsula. 3 of 10 volcanoes located in Shakalin Regions. Lets jump right in ! Klyuchevskaya is the highest mountain in Kamchatka Peninsula, and the highest of Active Volcane which located in Eurasia. This mountain is also the Natural Volcanoes of Kamchatka and it is list as UNESCO World Heritage Site. Klyuchevskaya first appear about 6000 years ago by nature. And the first eruption that had been recorded was about in 1697. Then after that, the eruptions still happen until today. There are some eruption among 2007 until 2015. Klyuchevskaya is the most sacred mountain. Some indigenous people says, the Klyuchevskaya is located which the first world created. Some believe this, and some other not. But, tis mountain is not recommended for hiking. In 1788, the first climbed man was died because of the lava blew out of there. You still can have the beautiful picture of Klyuchevskaya Sopka while you don’t climb it. Koryaksky lies over Pacific Ring of Fire, which can make the underneath sliding about 80mm per year. Geological has been recorded the three explotion eruption which happen at 5500 BC, 1950BC , 1550 BC. The three eruptions are the effusive lava flows. 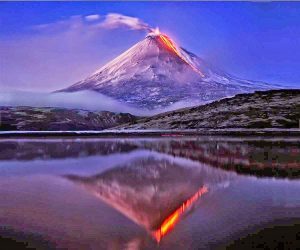 Avachinsky or called Avachinskaya is an active volcano too which located in Kamchatka Peninsula, which is neighbouring to Koryaksky Sopka. It has a horseshoe-shaped caldera which covered 500 kilometers area in south of volcano, underlying the city Petrapavlosk. History recorded that Avachinsky had 16 times eruptions. Recent large eruptions was happen in 1945 which make the lava runaway over 0,25 kilometers. The volcano continues effect of earthquakes and some fumaroles exist near the summit. Zhupanovsky is a compound volcano with height 2858 meters. It is have four overlapping stratovolcanoes. Three of stratovolcanoes were built in Pleistocene, and the fourth was built in Holocene which noted by historical eruptions volcano. Read more 8 Facts of International Men’s Day in Russia. Alaid volcano is also known as Atlasov Volcano because of this volcano is located on Atlasov Island. Alaid is the tallest volcano whic located on Kurile Islands. Historical noted that Alaid volcano was a stratovolcano which rises from the sea floor about 3000m. It is also the one that the most active volcano in Russia. The largest explosions was happened in 1790 and 1981 which noted among the Historical times. Bezymianny Volcano is one of the most active volcano in Kamchatka. It is now located between its sister which name Kamen and Kliuchevskoi. There are 3 peroids of intesified acitivity that geology noted for the past 3000 years. First, the activity started at 1955 which is errupted. Then, the event make a horseshoe crater. Since then, lava dome has been growing inside. Shiveluch volcano is the largest volcano and also the most active volcano in Kamchatka, which has the most violence errupted in Russia. Shiveluch volcano had more than 60 largest explosions and it is very violence in Russia for the past 10.000 years. There are many lava domes dot its outer flanks. We had done describe to you about Most Active Volcano That You Should Know in Russia. Hope this article would be add your knowledge about Russia and all around Russia. So, what do you think about Russia after you reading this article?